The biggest mistake this team ever made was ditching the Hawaiian blue for Royal. I sought to make a set that tipped the hat the cup winning jerseys with a little added flair. Silver is now a significant part of the striping and the electric motif is incorporated into the shoulder yokes. The primary logo is based off the inner part of the current shoulder patch with the large silver area restored. I loved how the reflective material glistened under the arena lights giving the crest an electric vibe. The alternate has an original logo I've used before and has a striping pattern that also uses the electric motif. C & C really appreciated at this point. Thanks for looking! 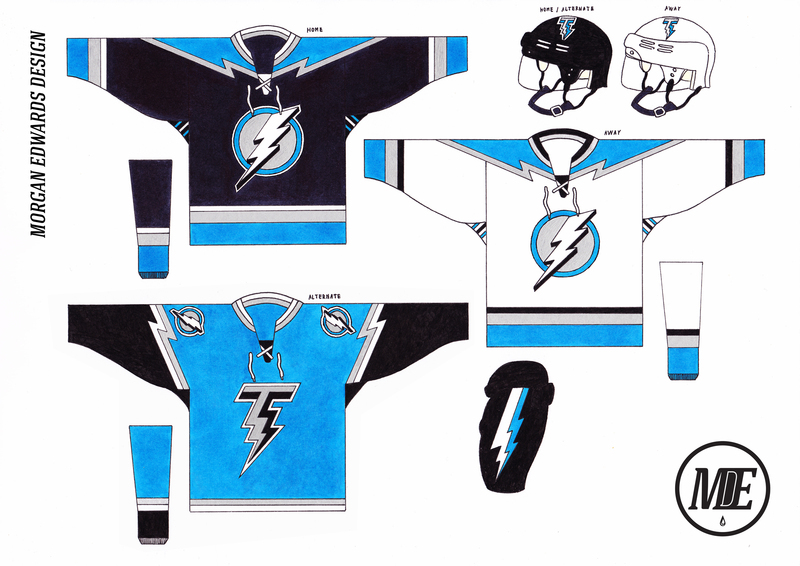 I love the Bolts concept except for one thing: The alternate's arms. The striping goes up a little too far for my tastes. If you were to put that concept into a flat or realistic form, the whole arms would be black, and I feel it would look too jarring & out of place. But besides that, this is what I'd love to see Tampa wear in some fashion. The logos are beautiful! They should use them right now. I also like the lightning pattern, I think you nailed what I've been trying to do for a while now. Ditto on the alternate's arms. They should be as low as the old Penguins PITTSBURGH jersey. It also could use a little black on the bottom, but that's not a big deal. But the overall is perfect. Absolutely what they should use. I know this concept has been done many times but you just can't beat the current logo on their original striping. 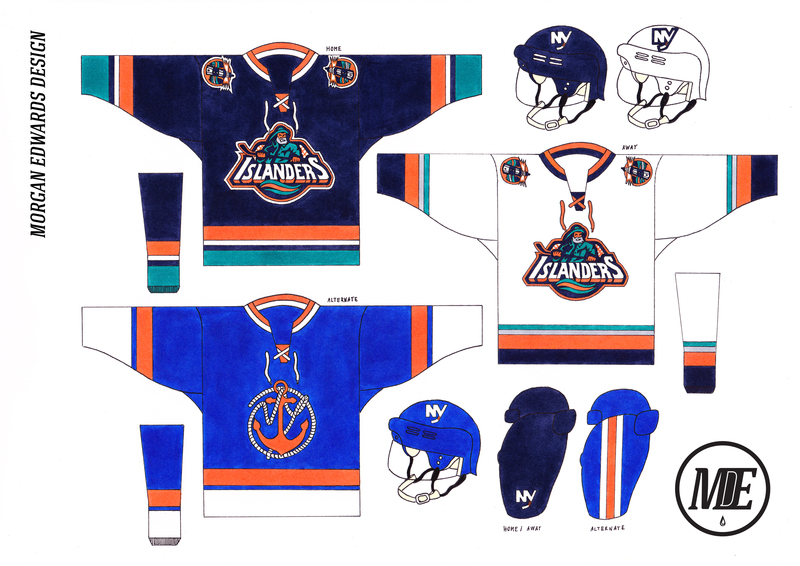 The fin shoulder patches retain orange to compliment the stick on the primary and laceups have been added to compliment the traditional striping. The alternate is a new take on their black armor uniforms with hem stripes added and the new, aggressive shark front and center. C & C appreciated, thank you for looking! 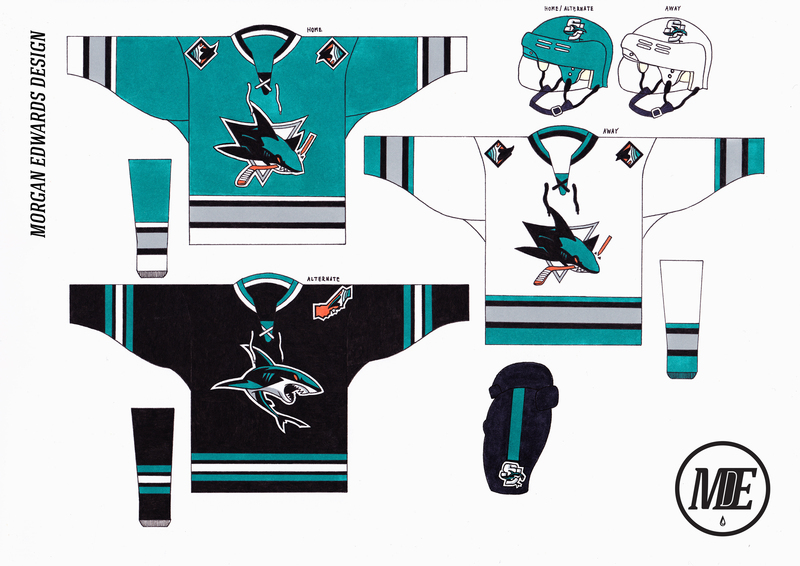 You could not be more perfect with your San Jose Sharks concept. Outstanding! 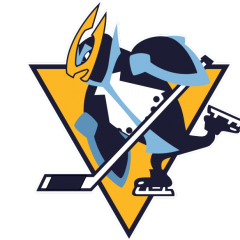 The Sharks look amazing & I like the patch you used for the alternate's shoulder, but not on the shoulder. I have a thing with state patches where I prefer them on the pants to the arms. But the new logo looks amazing on the front of a sweater. Great job here. The biggest mistake this team ever made was ditching the Hawaiian blue for Royal. IDK, I'd say ditching any last pretense of uniqueness in order to play Original Six Dress-Up was an even bigger mistake. I'm really digging your concept, though. They should be wearing something like those. Although there's nothing I would change about the Canucks current uniforms I thought I'd give Johnny Canuck a try on their classic template. 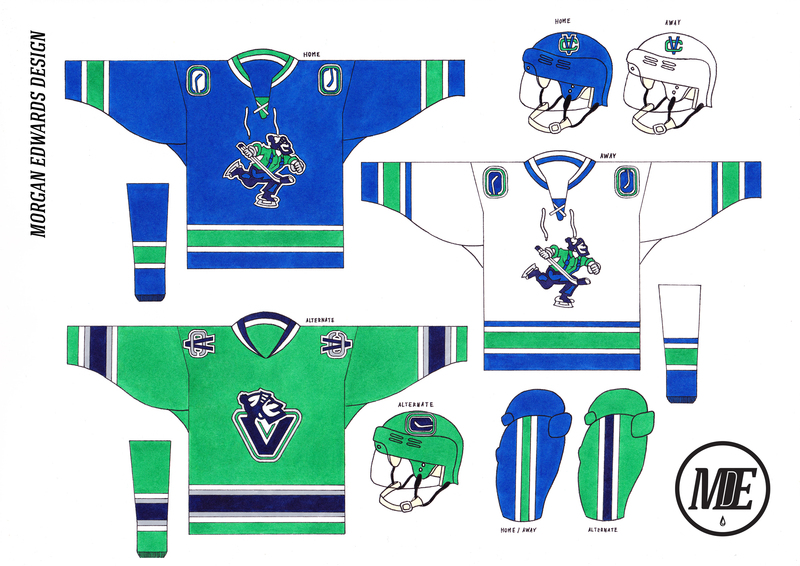 The alternate forgoes the royal blue for navy and uses the Canuck head. C & C appreciated as always, thanks for looking! This set looks amazing, the Canucks really need to get rid of the orca it doesn't represent them well. Johnny Canuck is the perfect representation of the Canucks, and that alternate is one of my favourites. I like the hem/arm stripes going all the way to the bottom on the road set. Something I've been thinking it needs for a long time. Thanks for the kind words everyone. Next team! 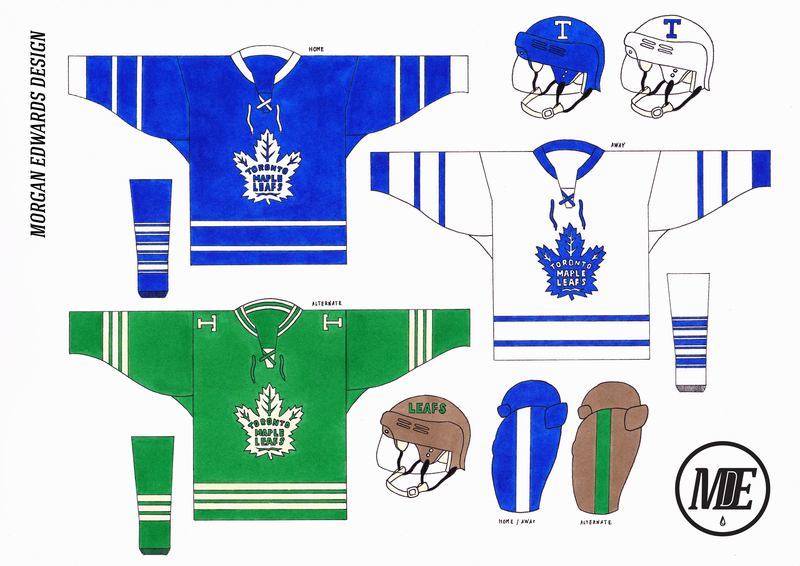 Since the Leafs unveiled their current uniforms I've wondered why they decided to forgo the twin stripes on the hem for a single one that inexplicably contours around the unnecessary scoop. The main set is pretty simple, I put the new logo on that familiar striping pattern, reinstated the old sock stripes and went with the Arena's logo on the helmets. The alternate is a fauxback that honours the St. Pats history and merges it with the current branding. I went with brown pants and a brown helmet to really hammer down the retro feel and added the Arenas logo to the shoulders so the uniform celebrates the entire history of the franchise. C & C appreciated as always, thank you for your continued support . I like the return of the triple Northwestern stripes on the socks! Big fan of the Jets current identity but I think too many teams are using navy as their main colour. It has almost become a crutch so I forged a new set around their lighter shade of blue. I think the current logo looks a lot better on that background. 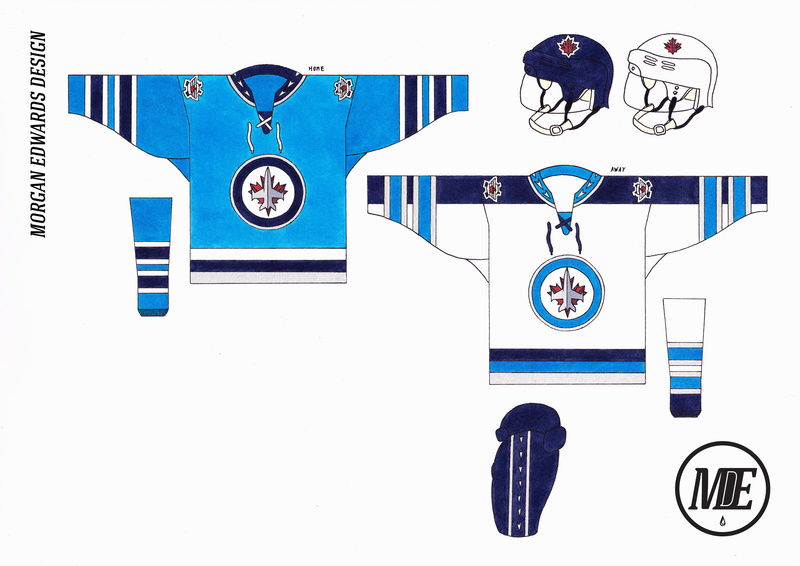 I also sought to tie-in the look with the team they used to be by using their arrow pattern on the collars and pants. C & C appreciated as always, thanks for looking! Wow, that blue is beautiful. Too bad they don't use it besides stripes. This is an amazing Jets concept. Keep it up. Time to wrap this series up. Next! 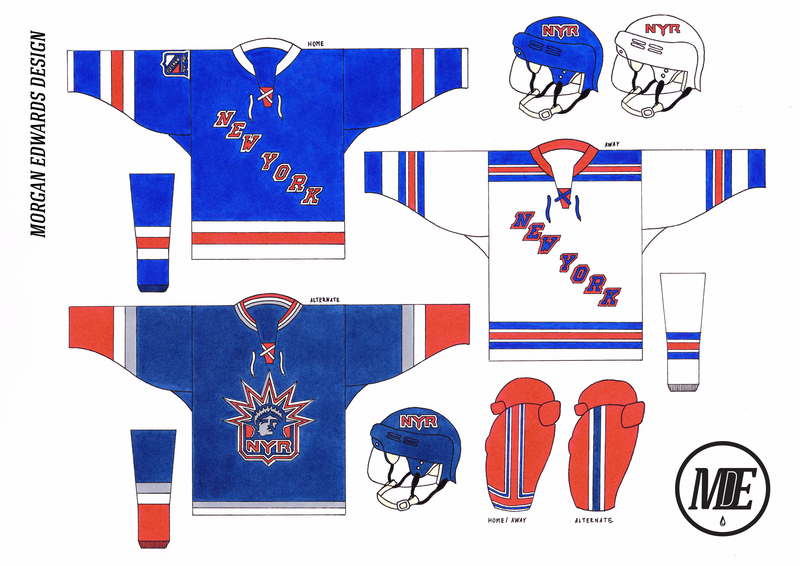 Always preferred the New York script to the Rangers one, maybe because it was so rare. Since the shoulders of their current homes are rather empty, I decided to add the traditional shield to one of the shoulders. A white collar was also added for more contrast. The alternate takes the essence of the Liberty sweaters with cleaner, bolder stripes and Indigo instead of Navy. I thought it was important to give it a minimal hem and its own red pant design. Never liked how the original jerseys used the full time pants with Royal blue added. C & C appreciated as always, thank you for looking! I think the jerseys are fine, as there's not a whole lot changed, but there are a few things I'd change. I think the home should read 'RANGERS' rather than 'NEW YORK', as it did in past jerseys. If you're going to add the 'NEW YORK' script, might as well be historically accurate too. I think the shield logo's placement on the home isn't a terrible idea, but is kind of off. As said above, it's in a bad place, and the fact that it's only on one arm is also a little weird. Regardless, it's a solid set of jerseys, and the whole series has been really good. I really admire how you make these by hand, with pen (Or marker, or pencil, I don't know) and paper.